They perform a wide repertoire of music, including arrangements and new works written specifically for them by composer and musical director, Dr Rick Chew. Word of Mouth is like a big band of voices, free-wheeling between contemporary classical, jazz, music theatre and choral theatre. In September 2017, Word of Mouth blossomed with the addition of voices from the Academy's acting program. 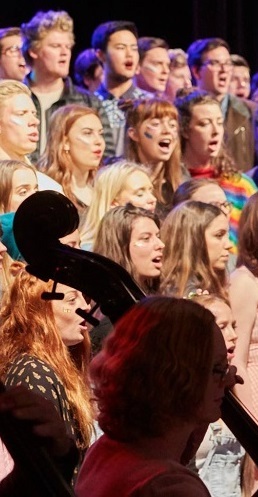 The ensemble joined forces with The BallaRat Pack Orchestra to take part in a magical rendering of What a Wonderful World, arranged by Dr Rick Chew. Why? Because the world needs more acts of love. Join the hundreds of thousands of people worldwide who have watched the film they created.